Microsoft's rumoured Lumia 1330 mid-range handset, which was spotted last month in an image, has been purportedly listed in a GFXBench benchmark along with its specification details. The Lumia 1330 is being tipped as the successor to the Lumia 1320. Until now, the blue-coloured rear panel of the rumoured device was the only clue that indicated the handset's existence. According to the GFXBench listing (via Nokiapoweruser), the rumoured Lumia 1330, codenamed RM-1062, features a 5.7-inch display with an HD (1280x719 pixels) resolution. A quad-core Qualcomm Snapdragon 400 ARMv7 processor is listed, along with Adreno 305 for handling the graphics. 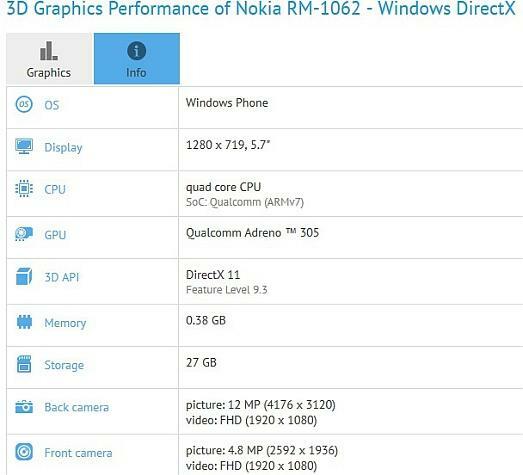 Besides DirectX 11 integration, the rumoured Lumia 1330 is also seen to include 1GB of RAM (shown as 0.38GB in the benchmark screenshot below). While the Windows Phone handset in the GFXBench test shows a 12-megapixel rear camera, it is actually said to feature a maximum image resolution of 13-megapixel and pack at least a 14-megapixel rear camera sensor as per another source via the website. A 5-megapixel (shown as 4.8-megapixel) front-facing camera is also suggested in the test results. In addition, 27GB of inbuilt storage is listed for the Lumia 1330, which points to 32GB of overall storage. While the launch date, availability or the price details of the handset in question are not yet known, Microsoft may introduce at the upcoming CES 2015 event in January in Las Vegas or during the MWC 2015 in February. Microsoft has until now launched only one Lumia handset without Nokia-branding, the Lumia 535.